Pete Anderson and Reeves Gabrels will be performing with their respective signature Reverend guitars at NAMM 2010. The Pete Anderson Signature is a decidedly retro-hollowbody affair with Reverend P90 pickups, a Bigsby vibrato and a noticeable Gretsch guitars influence. 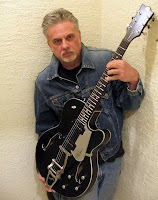 The Pete Anderson also incorporates a unique feedback-reducing design called the Uni-Brace to adapt the hollowbody instrument to a wider variety of musical (and higher volume) situations. The Uni-Brace, invented by Reverend Guitars founder Joe Naylor, is a 1/2" wide piece of wood that traverses the bass-side of the guitar underneath the lam inated spruce top, from neck block to bridge and also adds sustain to the instrument. Unlike the Pete Anderson, the Reverend Reeves Gabrels is a more contemporary design with a bolt-on maple neck and solid korina body with a flamed maple top. Featuring a Reverend humbucker in the bridge and a DiMarzio Fast Track 1 in the neck position, the tone control knob is also a push-pull phase switch for added tonal versatility. Both the Pete Anderson and Reeves Gabrels models feature Reverend's proprietary Bass Contour Control which alters the bass frequency response of the pickup, allowing their humbuckers and P90 pickups to sound like single-coils depending on the amount of bass rolled-off.